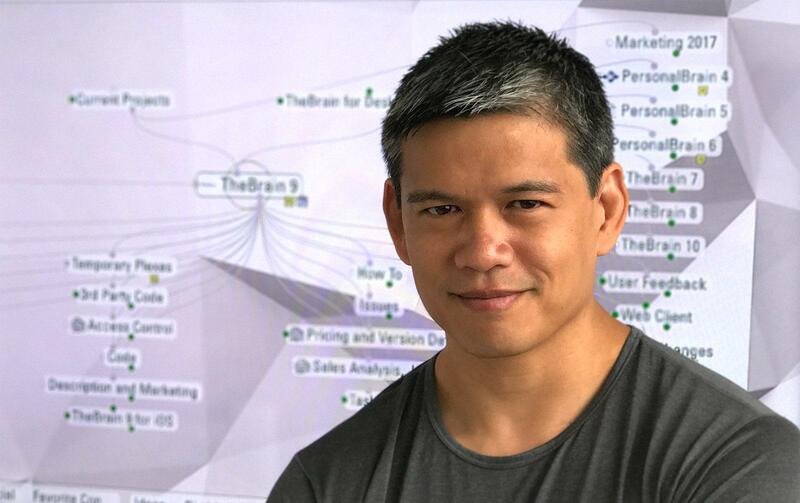 What were the key driving factors behind TheBrain 9′s development? Speed and ease-of-use are really two sides of the same coin. They both serve to make the technology as invisible as possible. When you’re trying to capture an idea or organize your stuff you want to be able to concentrate all of your energy on just that. Any time you spend trying to figure out how the technology works or waiting for it to do something is a distraction. We want to get that user interface “friction” down to zero so the software just disappears as much as possible. There’s been a lot of hype around the removal of Java from TheBrain 9. What’s that all about? Java was great because it enabled us to release TheBrain for both Windows and macOS. However the limitations of Java have become more and more apparent recently. It was preventing us from some key things that we had as primary goals for the next generation of TheBrain technology. Namely: a native UI that fits in seamlessly with your OS and the ability to leverage the best-of-breed solutions for things like databases and embedded browsers. The move away from Java was a huge investment for us as a company and a significant risk. It meant we had to rebuild over a decade worth of code inside of a single release cycle. When we started we didn’t really know if it was possible since abandoning Java also meant we had to find new ways of making a cross-platform solution. But thankfully it has all worked out. Not only do we have the native UI and best-of-breed solutions we were aiming for, but also the new code is much cleaner and provides a great foundation for version 9 and beyond. Finally, we have been able to create native software for not just Windows and macOS, but also iOS and Android, platforms we really had trouble with when using a Java codebase. This release has been a major journey for the team. What were some of the challenges? Without a doubt the hardest part of creating TheBrain 9 has been living up to TheBrain 8. A dedicated team started working on TheBrain 9 at the same time as work began on TheBrain 8. After a year of development version 8 was ready for release and it seemed like the new code for version 9 was well on the way to replicating the core features of TheBrain. The team that worked on version 8 was now able to reinforce the version 9 team. We thought we might be done in another year. Two years at most. But the devil, and the beauty I’d argue, really is in the details. All of the small seemingly innocuous options and little things that the software does may seems like minor adjustments and adornments but in reality they probably took up over 80% of the development time. Now that it is finally ready for release we’ve worked on TheBrain 9 for well over 5 years. Can you describe how the interface design of TheBrain 9 evolved and some of the influences that contributed to it? Since we were starting from scratch on the engineering side of version 9, I wanted to take advantage of that fact and not simply rebuild the same interface we were already used to. I tried to imagine how TheBrain would work if whittled down to its most basic functionality without any buttons, menus, windows or other controls at all. From there, every control that was added was done so only after examining whether it was really necessary and trying to come up with other ways to accomplish the same thing without adding complexity to the interface. Of course, there is a delicate balance needed between simplicity and discoverability. The extended preview and beta cycle allowed us to gain iterative feedback from users that helped a lot with this balance. People’s level of exposure to different UI’s has exploded along with the proliferation of the Web and mobile devices. The expectation levels are much higher than they were just a few years ago. We wanted to embrace that and so TheBrain’s interface features many custom components built specially for TheBrain 9 and fine-tuned over the years. Overall, I think TheBrain 9′s interface has managed to significantly push forward on two normally conflicting fronts: ease-of-use and depth-of-functionality. But it doesn’t really matter what I think. The true test is how TheBrain’s users react. Whenever changes are made to something that people depend on every day, it’s bound to be controversial. I’m proud to say that the feedback we’ve been getting from people who are now seeing version 9 for the first time has been overwhelmingly positive. We thought that the most important accomplishments of TheBrain 9 were going to be system-level things like speed and reliability, but in surveying users, we discovered that the favorite improvement by a large margin is the new user interface. Version 9 is all-but-finished… Over the next few months you will see big improvements to the Web client for TheBrain 9 as that is the final piece of the puzzle. We talk a lot about the Windows and macOS clients, but don’t forget there’s also new clients for iOS and Android too. Those are currently only available in the beta programs but they will see general release soon also.